But if your TV is still in the box, you may be wondering, “How exactly am I going to get this thing mounted on the wall?” If so, not to worry. Below, we explain the exact steps needed to mount your TV onto the wall. Step 1: Make sure you have the right tools, including a drill, screwdriver, studfinder, tape measure, leveler, and pencil. These will come in handy when mounting the TV. Step 2: Decide how you want the TV to be centered. Usually, people consider the furniture and other features of the room. For example, you might want to center the TV above the mantle or above your entertainment center. On the other hand, you might want to center it with your couch. Either way, you should aim to have the TV at eye level when you are viewing -- or close to it. Step 3: Create a “target” with painters tape. Once you’ve decided where the TV should go, give yourself a visual guide by laying down some tape (which can be removed later). 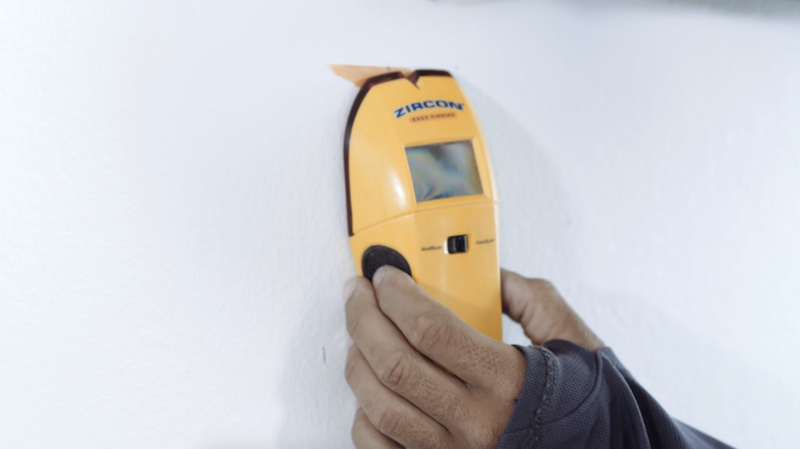 Your tape measure can help in creating a target that’s the correct size. You’ll use the tape as a reference while mounting your TV. Step 4: Double check that you have the correct wall mount (also known as a bracket). 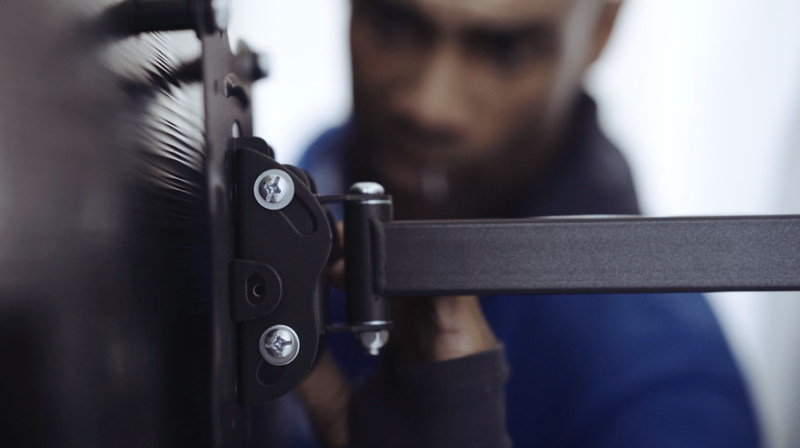 There are three main types of brackets or mounts: fixed, tilted, and full-motion, which determine how much your TV can move side-to-side or up-and-down. The type is entirely up to you. Your mount also needs to support your TV size and weight. For example, if you have a 65” TV, the packaging of the mount should tell you it can hold a 65” TV. Make sure the holes on your mount line up with those on the back of your TV. Step 5: Decide what you will do with the cords. Just about every TV has its own cords. So before you start mounting, consider where you plan to hide those cords at the end. You might decide to conceal them inside the wall or outside the wall (Puls can help with this). Now it’s time to drill! Step 6: Use the studfinder to determine where the stud is. That basically means you need to figure out where the wooden support beam is behind your wall, so you can drill into the wood and not into the hollow drywall (drywall alone typically cannot support the weight of the TV). Step 7: Mark exactly where the screws will go. Hold the mount against the wall on top of the stud and use a pencil to mark where the screws will go. This will be your blueprint. Step 8: Use the drill to pre-drill the holes in the stud. Take the drill and drill some empty holes into the wall where you have made pencil marks for each screw. Step 9: Install “strap toggle bolts” in each hole. If you’ve never heard of a strap toggle bolt, it’s a handy item that helps to anchor your screws in the wall. It can be purchased at most hardware stores and installed very easily. 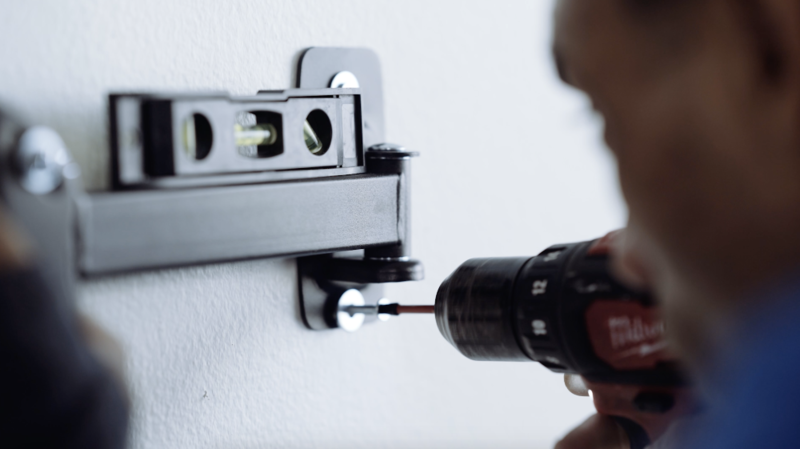 Step 10: Hold the mount against the wall drill in the screws. Leave the screws slightly loose while you adjust the placement of the mount, then come back and tighten them. Step 11: Use a leveler to ensure the mount (and TV) will be level. The leveler is a handy tool that will show whether your mount is crooked. Place the leveler on the mount and look to see if the air bubble is directly in the middle of the crosshairs. The last thing you want is a crooked TV! Step 12: Place the TV on the mount. Make sure the mount is secure before trusting it to hold the weight of your TV. Once the TV is on the mount, take a look to see if it appears level and then screw it securely into the mount. Step 13: Conceal your TV cords. Most people don’t want the cords hanging down since it looks a bit messy. There are two main ways to conceal them: internal or external. 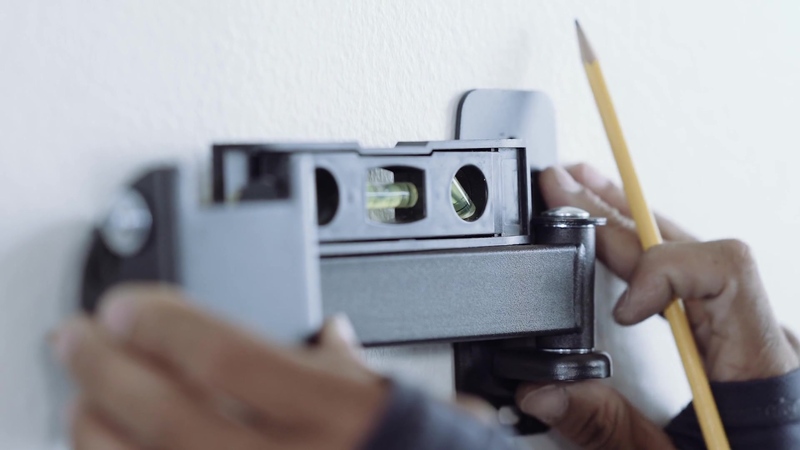 Internal concealment requires installing them behind the drywall, which can be done by a professional technician from Puls. An external concealment kit can be purchased at a local hardware store. Step 14: Clean up and enjoy! Once you’ve swept up any paint chips or dust from the drilling, you’re all done, so get ready to watch your favorite shows on a beautiful, new high quality television. 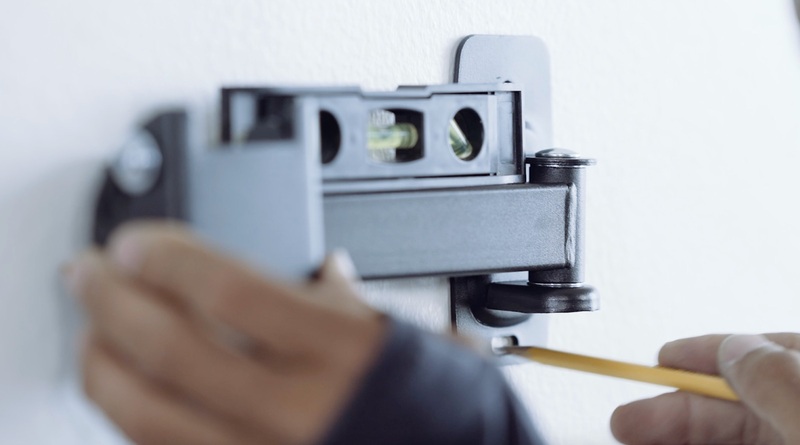 If you're not particularly crafty or you simply don't feel like dealing with all the heavy lifting and drilling, it's important to remember that self-installation certainly isn't for everyone. That's why we're here to make things easy. Our skilled technicians will do all the drilling, lifting and technical configuration for you, so you can simply sit back, relax and get ready to enjoy your newly mounted TV. We can even help you conceal wires, mount shelving and sound bars, or hook up devices like your XBOX.